.925 RHODIUM SILVER NECKLACE WITH CRISTALS, SPOTTED QUARTZ PENDANT. This item is selling for $205.99 on eBay. Beautiful 925 Silver necklace, rhodium (white gold effect), chain ring, two size of faceted transparent Crystals,(diameter 0,6 - 0,9 cm), a central element in spotted Quartz, from blue to gray, diam 2,8 cm. 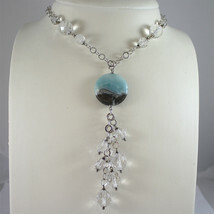 This is a beautiful necklace made with .925 sterling silver and Crystal and Quartz.